(e.g. causal auxiliary verbs and causal connectives) have mainly been studied in isolation. The present study constructs an integrative perspective on the semantics of causality markers. 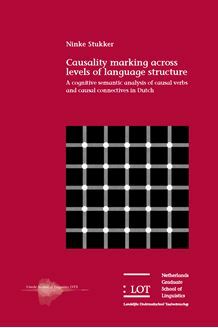 Making use of empirical methods, it analyzes meaning and use of the Dutch causal verbs doen and laten manifest on the ‘clause level’, and of the Dutch causal connectives daardoor, daarom and dus manifest on the ‘discourse level’ of the linguistic structure. The integrative usage-based perspective taken here refines the understanding of the linguistic expression of causality in general, as well as the understanding of mechanisms relevant at the level of individual constructions. The findings of this study suggest that discourse level expressions are subject to the same principles and mechanisms as the clause-level phenomena that are usually focused on in cognitive grammars. In addition, it shows that cognitive semantic principles can successfully be used to refine textlinguistic theories on causal expressions. The results of this study offer additional empirical evidence for a basic assumption in cognitive semantic theory, namely, that a direct link exists between semantic categories and the conceptual categories in every-day thinking. Causality marking across levels of language structure is of interest to scholars concerned with the linguistic expression of causality, and to scholars working in the fields of text linguistics or (cognitive) semantics.